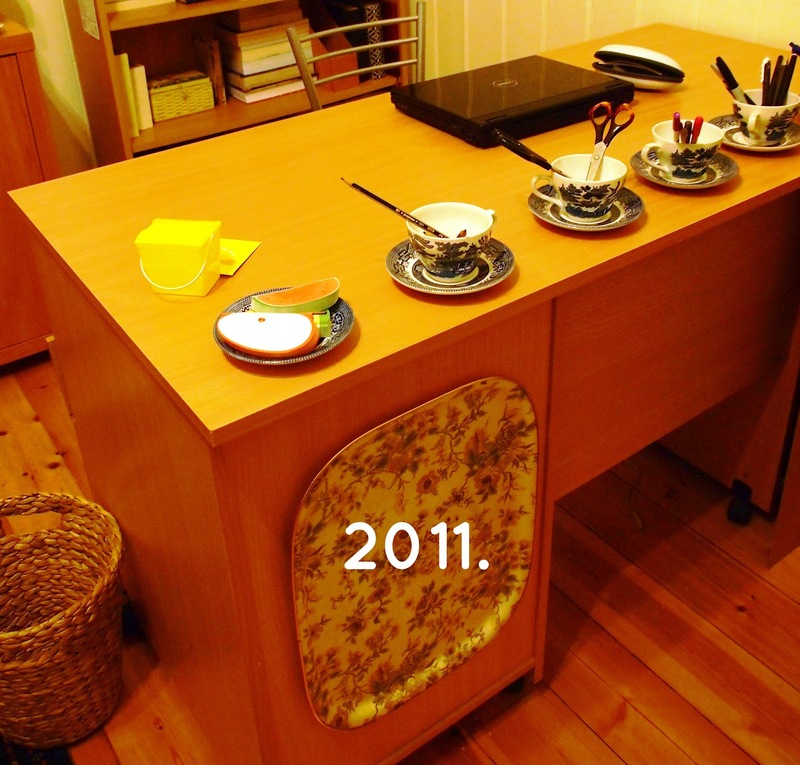 THE THRIFTY CHALLENGE: The evolution process: dining room/study. 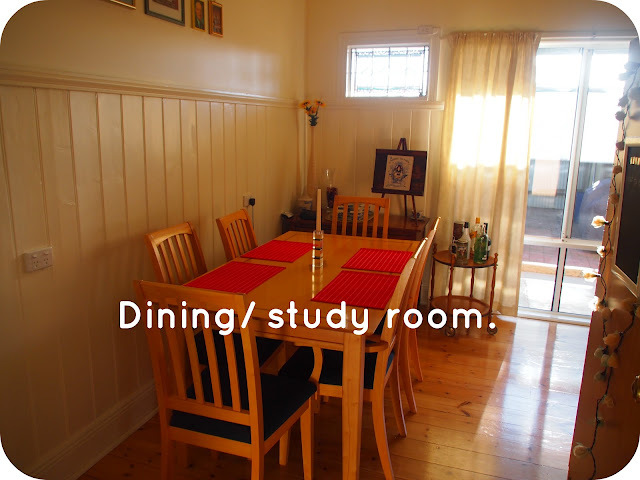 The evolution process: dining room/study. 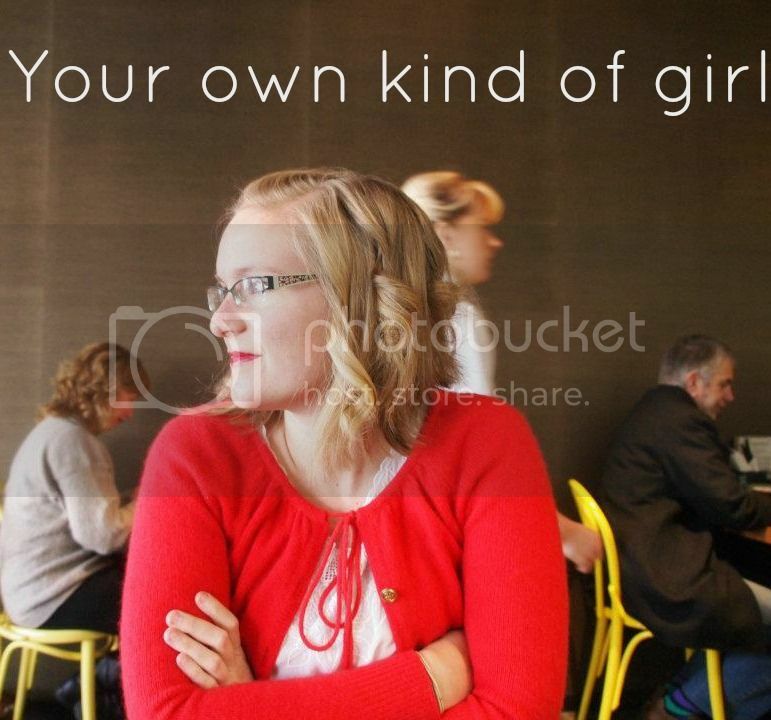 This is the second post in my new regular feature The evolution process. The aim of this series is to show you that you do not need a lot of money to live in a nice place. I am so happy with our home (though I always keep changing it), yet we have spent very few $ furnishing it. Last week I shared our guest room and this week I'm excited to see the dining/study room! In the past this room has been a bit of everything room and still kind of is. It began as a study and craft room when we first moved it. It was full of lots of books and a sofa bed which became our 'second guest room'- a necessity when you live away from family and friends and get lots of visitors. When I look back, I see a room where everything was just placed in there and not much thought was given to make it seem nice. All the furniture was thrifted and the only things I actually loved in the room was my eisle (handmade by my Grandpa) and the bar stool which I reupholstered with yellow leather. The desk went on a journey all around the room. It began on one wall and ended on another wall. However as a got more and more settled into my classroom , the desk became an item of the past and was sold off to make room for a dining room table. See we don't really have a dining room and used to eat in the kitchen until we got a larger fridge and suddenly the table didn't fit anymore. The only structural change we made was to remove the old airconditioner (that we never used) and replace it with a pretty leadlight. Everything in this room is second hand and thrifted. The table was from a family friend so it's not quite the perfect table yet but it'll do for now. When I update furniture I try to sell off the old furniture (or give to family and friends) as I don't want to clutter up our home. My bestie gifted me this beautiful coffee table book which inspired this display. The little pot was a gift from our sponsor child when we visited him in Rwanda in 2009. The tray, cups and mini eisle were all thrifted and the rose petals are from our garden. Since the rooms in our home are quite large but there aren't many, I decided to divide the room in half using a bookcase. That way people could sleep on the sofa bed (if we had more than a couple staying over) and we would still have a dining room too. It's kind of nice too to have a little reading nook. You can also see my rake wine rack. The pin board (which is currently empty) was a DIY project, using an old pin board, material, blue paint and a staple gun. The cushions were bought on a holiday to vietnam. The crate bookshelf was made by screwing three thrifted crates together. I kind of like the rustic appeal. This is my wardrobe that I fixed up. Above it is a dolls house that I also use as a bookcase. The magazine rack and cute canisters were thrifted. This photo shows how the room has been divided in half to work successfully and you can see my wall display. I've used scrabble letters to label the shelves and I thrifted the drinks cart and globe. So that's how I styled our dining/study room and make the space work for us. Our home is constantly evolving and I'm trying to figure out the best way to store all my copious amounts of crafting supplies and perhaps create a space to work at too. Any suggestions? Your home looks so cozy! I love it!! Thanks for taking part in my button swap, I love your style. Especially the book shelf. I would love some for the top of our stairs but they always seem to be so expensive! !